It might not be the cheapest way to see the area, but Queenstown Scenic Flights must surely be one of the most memorable. Fly over the majestic Remarkables, or around Mt Cook/Aoraki. Milford Sound is a short hop away, too. Scenic Flights in Queenstown are a great way of getting to see places that you might otherwise be pushed for on time, to reach. Whether you want to stay local and float over the breathtaking mountains and lakes of Queenstown and Glenorchy, or head up to Milford Sound and Fiordland, there's a good range of flights to suit most budgets. 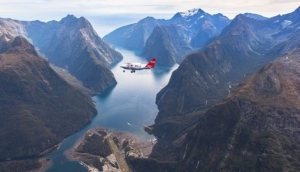 Milford Sound is the most popular destination for a scenic flight out of Queenstown. Companies like Air Milford, Glacier Southern Lakes Helicopters and HeliTours all operate tours to this beautiful corner of the world. The Helicopter Line offer an icy alternative, zooming you over glaciers and mountains, and often include an alpine or glacier landing while U-Fly Wanaka let you take the controls of the plane! If money is tight, you could try buying a coach/flight combo ticket, enjoying a scenic drive from Queenstown/Te Anau up to Milford Sound, then flying back. You can also fly over wine country, with HeliTours.